Houston is a multinational, world-class city. It is a major hub for the medical, energy and space industries, and an important city for international commerce. As a growing center for the arts, it has globally renowned museums and a large theater district. Employers in Houston do not limit their search for talent to the local population, the state population or even the national population. Employers in Houston, TX, are in a position to look for the brightest and the best around the world. Doing so requires navigating the complex, and often onerous, immigration system. 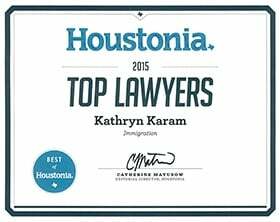 Kathryn Karam is a dedicated Houston immigration lawyer who assists Gulf Coast employers with bringing in talented workers from around the globe. She assists with immigrant and nonimmigrant visas for potential permanent and temporary employees. The immigration system can be complicated. Every employee has a different background and different issues, and there are few cookie-cutter situations. Kathryn Karam is experienced with complex immigration issues, and prides herself on finding creative solutions. Call today at (832) 582-0620 to schedule a consultation to discuss your employment-based immigration matter. Karam Immigration Law serves businesses and employers throughout the Houston area, including in the Galleria area, the Energy Corridor, Sugar Land and The Woodlands. If you are looking to fill a position with a person coming from another country, one of the most important aspects will be the nature of the position: If it is a permanent position within your company, or it is a temporary one. If your company seeks to fill a permanent position, a temporary visa may be required to move the employee to the United States to commence employment. In order to keep the employee in a permanent or long-term position, you will need to sponsor the employee for permanent residence, often called a "green card." As a permanent resident, the employee will be able to live and work in the United States indefinitely and will be required to renew the green card every 10 years. Your employee will have many of the same rights and privileges as U.S. citizens. He or she may eventually seek to become a naturalized U.S. citizen after obtaining permanent residence. Wait times for obtaining a green card depend on the qualifications of the employee, his or her country of birth, and the position you are seeking to fill. If the position is temporary, you will seek an employment-based nonimmigrant visa for the employee. Both the type of visa required and the wait time to receive the visa will depend on the qualifications of the employee and the nature of the job. In most circumstances, the employee will be able to obtain visas for his or her spouse and children as well. In some circumstances, the employee’s visa may be "dual-intent visa," which will allow him or her to have a temporary worker visa and at the same time, seek permanent resident status. Investors / Entrepreneurs: People making significant investments in a new or existing business in the Houston area are one of the few people who can self-sponsor for a visa. There may also be temporary visa options for some investors. Professionals in STEM fields: Houston is home to many petroleum companies, oilfield services providers, and IT companies. . Engineers, Computer Software Analysts, Geophysicists, Geologists may qualify for temporary work visas. Performers, Artists and Athletes: People in these types of visas fall under special visa categories, especially those who have earned international regard or acclaim. Teachers: School districts and private schools can seek to recruit talented teachers from other countries. Doctors and Medical Professionals: Houston is home to the Texas Medical Center, the largest concentration of hospitals and clinics in the world. Ground-breaking discoveries are made routinely, and the top medical talent seeks to come here. Spouses and Children: The spouses and children of employees usually have the option of uniting in the United States. An attorney will look at the specifics of the employee you are seeking to sponsor for a visa, and determine the best and fastest route to obtain the proper visa. Each potential employee has a unique situation and specific requirements may apply. This is why it is critical to engage an attorney who understands the immigration system and knows how to find creative solutions to any issues you may encounter during the process. An immigration lawyer can help you tackle any situation that might come along. Houston has many educational opportunities: Rice University, the University of Houston, the University of St. Thomas, Baylor College of Medicine, the University of Texas Health Science Center and others. If you are a potential student outside the United States seeking to attend one of these schools, you must obtain a student visa. An attorney in Houston can assist you with the entire process. If you are completing a degree or academic program, and wish to pursue an employment opportunity here in the Houston area, you must obtain a new visa before the expiration of your student status or Optional Practical Training (OPT) period. If you are an employer in the Houston area seeking to bring talent from outside the United States, you will need to navigate the complex immigration system. As a Board Certified in Immigration and Nationality Law, Kathryn Karam has the skills and experience to serve as your guide.Call Karam Immigration Law today at (832) 582-0620 to schedule a consultation to discuss your employment-based immigration needs with an experienced Houston immigration lawyer.